Earlier today, the Daily Beast reported that intelligence gleaned from an Al Qaeda conference call — which included the organization’s leader Ayman al-Zawahiri and at least nineteen other Al Qaeda representatives from around the globe — is what led to the closing of 22 U.S. embassies last weekend. “Al Qaeda leaders had assumed the conference calls, which give Zawahiri the ability to manage his organization from a remote location, were secure,” the report says. Through our own sources in the intelligence community, Daily Intelligencer has secured a partial transcript of that conference call. Female Robot Voice: Farouk has arrived. Female Robot Voice: Farouk has left the conference. Ayman al-Zawahiri: Farouk, are you there? Farouk: Can you hear me? 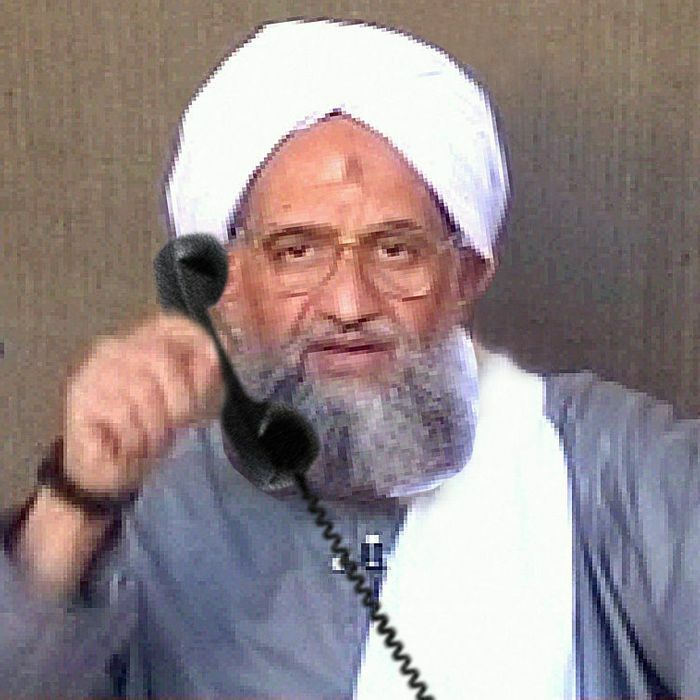 Ayman al-Zawahiri: Yes, I can hear you. Can you hear me? Ayman al-Zawahiri: Uh, okay, so, thanks, everyone, for taking some time out of your Saturdays. I know that planning the destruction of the West is very time-consuming and you’re all very busy, so let’s just get right into it. Mohammed, how is your effort to plant bombs inside adorable baby ducks going? Mohammed: It’s coming along. It’s proving more difficult than I expected, but I think once we work out the kinks this is going to be a great success. Ayman al-Zawahiri: What kind of timetable are we looking at for that? Mohammed: I’d say another six to ten months, assuming we don’t run out of baby ducks. Ayman al-Zawahiri: Great. So, next I’d like to turn to Nasser. Now, Nasser, you’re planning to carry out a huge attack any day now, correct? Ayman al-Zawahiri: Hold on a moment, Nasser. Abdul, is that you? Abdul: Yeah, it’s me. It’s just, it seems pretty clear to me that some U.S. intelligence agency or another is spying on pretty much every form of communication at this point. Holding a conference call in which the world’s top Al Qaeda leaders discuss their terror plots just seems like an incredibly bad idea. Ayman al-Zawahiri: Heh, come on Abdul, nobody’s listening. Abdul: What? Have you not been reading these Guardian reports? Ayman al-Zawahiri: I think I heard something about it a while ago, but it didn’t sound that interesting. Abdul: Listen, I … I have to go. I think this is incredibly risky. I’m gonna go. Ayman al-Zawahiri: Sure, that’s fine, Abdul. I understand that you are paranoid. We’ll send you the minutes of the conference call later … via donkey! Female Robot Voice: Abdul has left the conference. Ayman al-Zawahiri: I don’t know why we keep Abdul around. That guy is craaaay-zeee. Now, what were we talking about? Oh, right — the huge enormous terror plot.